356 pages | 43 Color Illus. | 20 B/W Illus. Focusing on images of or produced by well-to-do nineteenth-century European women, this volume explores genteel femininity as resistant to easy codification vis-Ã -vis the public. Attending to various iterations of the public as space, sphere and discourse, sixteen essays challenge the false binary construct that has held the public as the sole preserve of prosperous men. 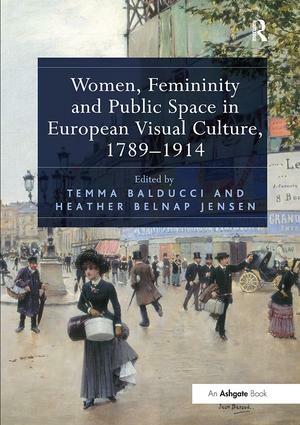 By contrast, the essays collected in Women, Femininity and Public Space in European Visual Culture, 1789-1914 demonstrate that definitions of both femininity and the public were mutually defining and constantly shifting. In examining the relationship between affluent women, femininity and the public, the essays gathered here consider works by an array of artists that includes canonical ones such as Mary Cassatt and FranÃ§ois Gérard as well as understudied women artists including Louise Abbéma and Broncia Koller. The essays also consider works in a range of media from fashion prints and paintings to private journals and architectural designs, facilitating an analysis of femininity in public across the cultural production of the period. Various European centers, including Madrid, Florence, Paris, Brittany, Berlin and London, emerge as crucial sites of production for genteel femininity, providing a long-overdue rethinking of modern femininity in the public sphere. Contents: Introduction, Temma Balducci and Heather Belnap Jensen; Marketing the maternal body in the public spaces of post-Revolutionary Paris, Heather Belnap Jensen; Baroness Hyde de Neuville and the sidewalks of New York, 1807-14, Laura Auricchio; Mediating private and public: Juliette Récamier’s salon at L’Abbaye-aux-Bois, Daniel Harkett; The female artist in the public eye: women copyists at the Uffizi, 1770-1859, Sheila Barker; A woman abroad: Emma Brownlow in Brittany, Pamela Gerrish Nunn; Representing the modern woman: the fashion plate reconsidered (1865-75), Justine De Young; ‘Excessive Industry’: female art historians, popular publishing and professional access, Amy M. von Lintel; Connaisseuses and cocottes: women at the Salon in French caricature, Karen J. Leader; Aller à pied: bourgeois women on the streets of Paris, Temma Balducci; De paseo: tracing women’s steps in Madrid’s late 19th-century illustrated press, Vanesa Rodríguez-Galindo; Women, art history and the public sphere: Emilia Dilke’s 18th century, Elizabeth C. Mansfield; Walking the dog à la ville: Louise Abbéma, women and the Parisian landscape, Miranda Mason; The boarders and borders of Emily Carr’s London Student Sojourn, Samantha Burton; Separation and erasure: the fate of women artists in Vienna, Julie M. Johnson; Single women, public space and the German Ledigenheim, Erin Eckhold Sassin; Gertrude Stein ‘facing both ways’, Annalisa Zox-Weaver; Selected bibliography; Index. Temma Balducci is Associate Professor of Art History at Arkansas State University, USA. Her research focuses on the intersection of gender and visual culture in nineteenth-century French art and in feminist art of the 1970s. Heather Belnap Jensen is Associate Professor of Art History & Curatorial Studies and Women's Studies Faculty Affiliate at Brigham Young University, USA. Jensen specializes in women in post-Revolutionary French culture.